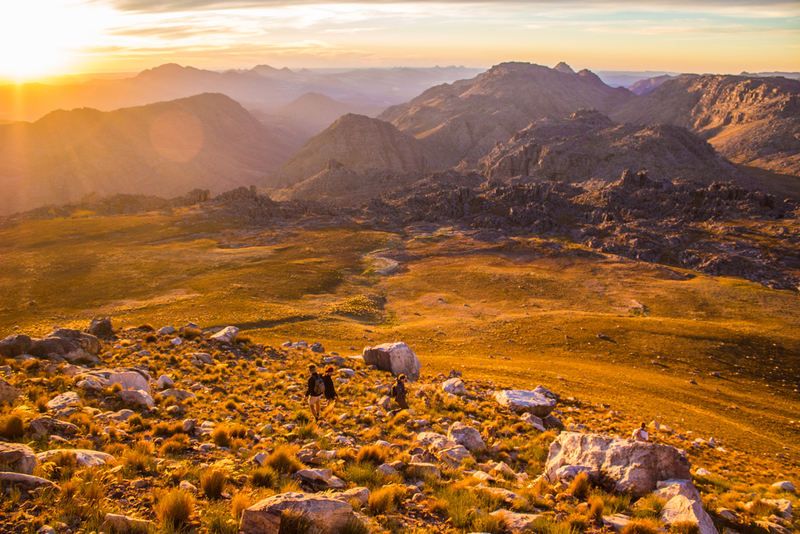 With its ancient mountains, bizarre rock formations, and magnificent cedar trees, the Cederberg is one of the most unique and beautiful places in South Africa. 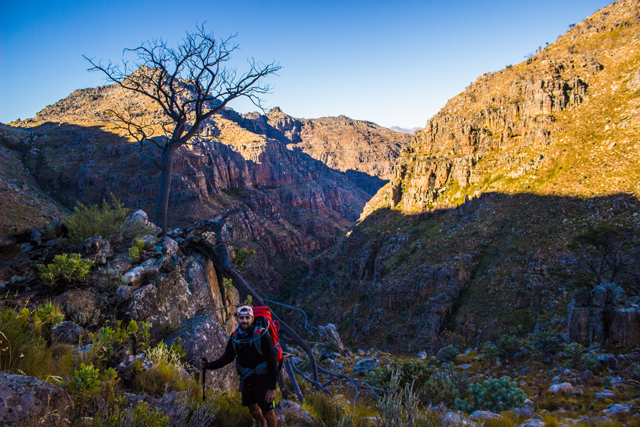 It’s also much more dynamic than you might think – we encountered wildlife and rich pockets of life around almost every corner. *All vital info like maps, contact numbers and fees are at the bottom of the post. We left Cape Town early and parked our cars at the Algeria campsite where we followed the popular route up to the waterfall. There were other groups here but we left them and carried on up. We wouldn’t see anyone else for the rest of the day. 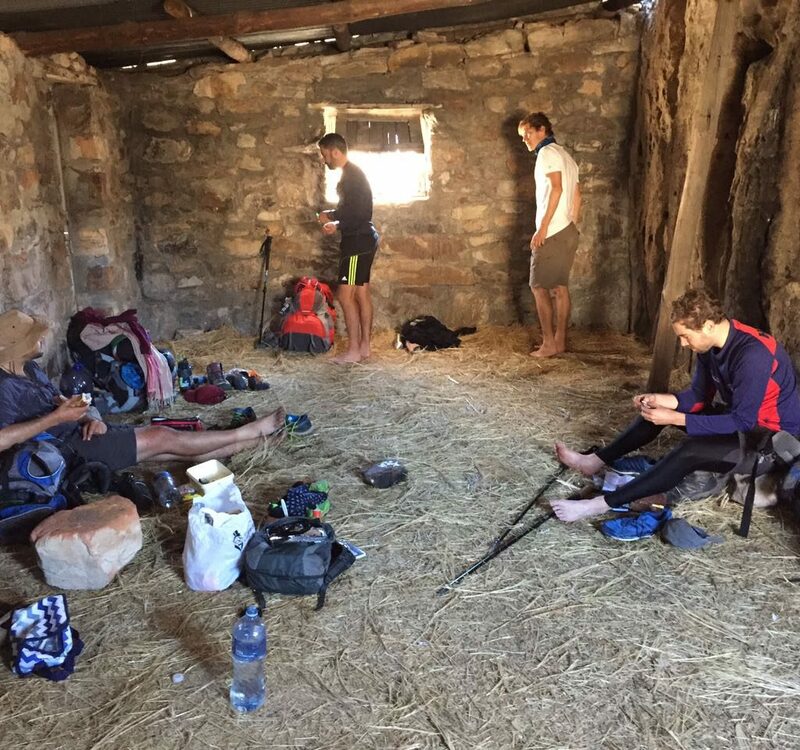 After about three hours we reached the plateau and our hut for the night, the stable-like Middelberg hut. Nearby there was a stream where three oaks offered shade and a place to relax. Nearby we found this ancient cedar looming above a group of boulders. 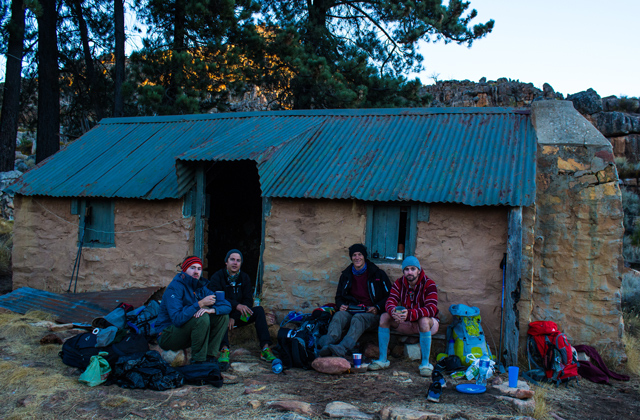 In autumn, the temperature drops rapidly as soon as the sun goes down so we got warm and ready for the night. The hut has a concrete floor that is covered with straw and the door needs rocks leaning against it to keep closed. Pure mountain bliss! After oats and coffee, we followed the path and looped around to the left while the morning moon kept us company. 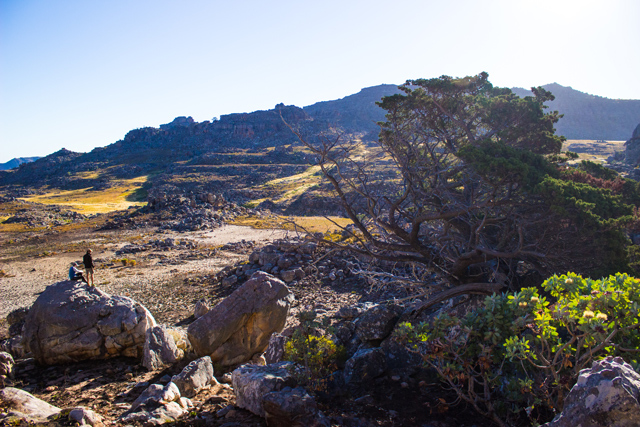 We found a small cedar forest not far from the Middelberg hut. 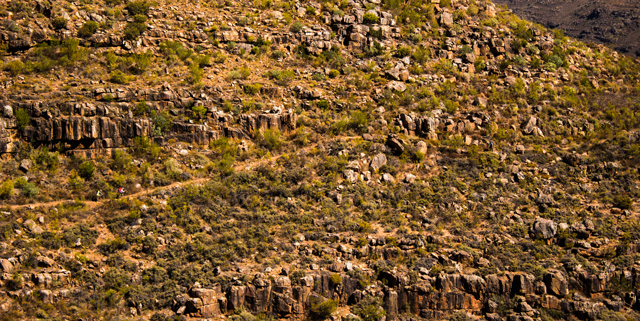 The endemic Clanwilliam cedar tree occurs only in the Cederberg mountains. The number of trees has declined dramatically over the past two centuries, partly due to exploitation and partly due to an increase in fire frequency. Gregg and Leon look back on the cedar forest and our hut, which lies at the base of the far mountains. The trees seem to grow out of the boulders that dot the landscape. Check out the green branch on the edge of the tree! 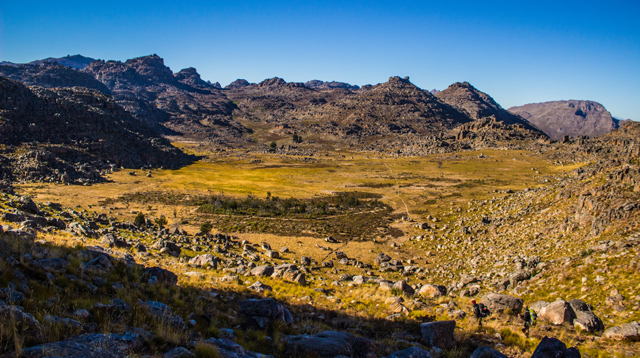 At the end of summer, in the middle of a drought, we expected the Cederberg mountains to be dry and yellow but we found water wherever we went and little marshes in the valleys we passed through were also common. The second half of the day’s hike we looped back to the Algeria campsite on long, unshaded stretches of trail. Day 3 started quite leisurely even though we had a long way to go, our longest day of the trip. 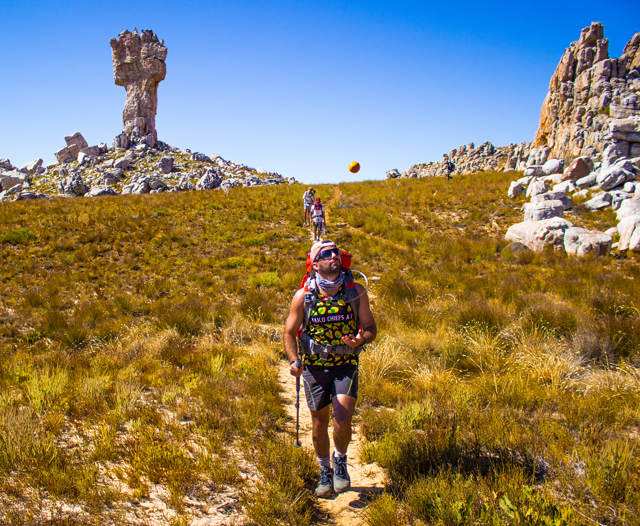 Approaching the Maltese Cross, a Cederberg landmark, with Sneeuberg in the background. Gotta get those vitamin C’s in ya! Leon pondering what our afternoon will entail. 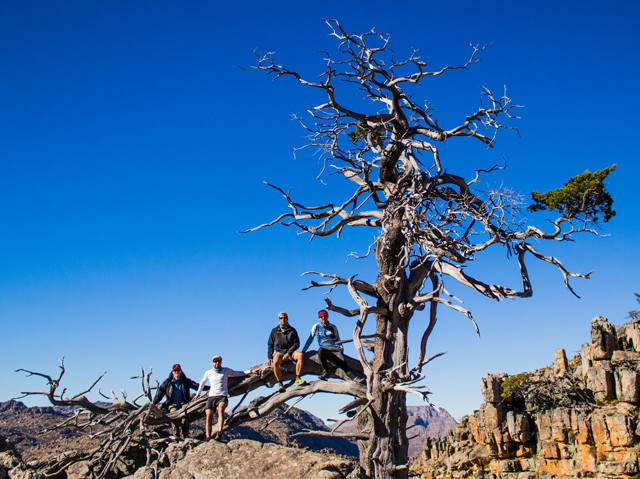 We dropped our big bags off at the hut, had a quick lunch and then made our way for the Sneeuberg summit. See what I mean about the huts looking like stables? Things got hectic quickly! 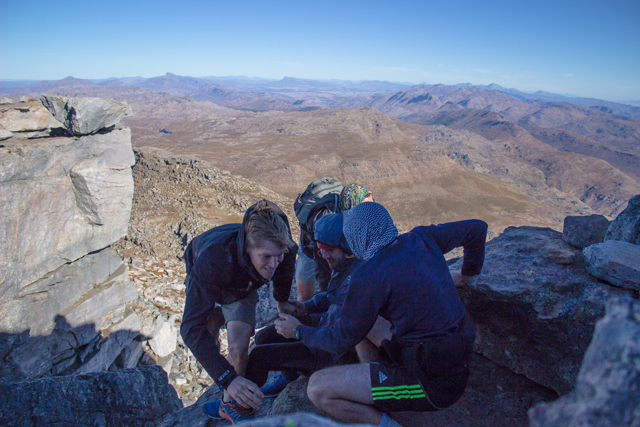 Sneeuberg is a pretty challenging mountain to summit. It’s high, the winds are strong and the trail is tricky to follow. It’s best to go with someone who knows the way. 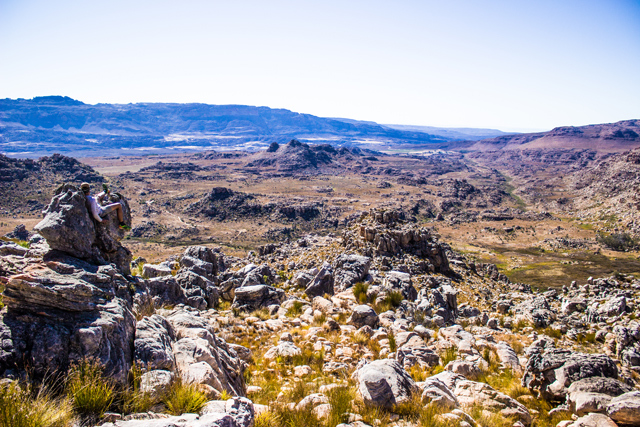 Luckily for us, we were with Henri, a Cederberg veteran. The closer to the top, the more intense it gets. There are some serious drops and the wind was really gusting! Stoked with the summit and a bit more relaxed on firmer ground. We could see for miles up there, all the way to Table Mountain, 250 km away. 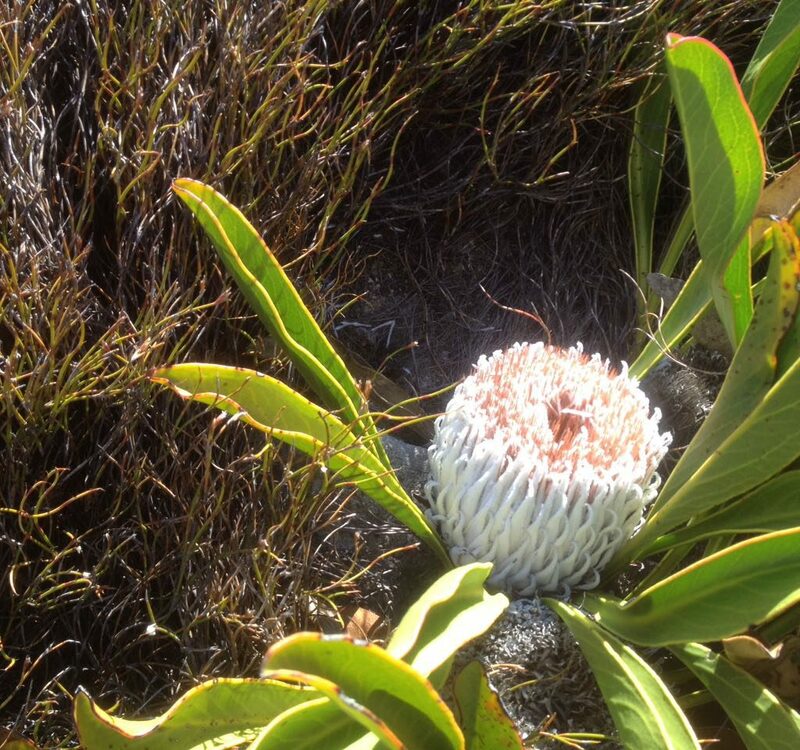 We came across snow proteas up there, which only a few of us even knew of. This rare plant only appears above 1,700 metres. It survives a wide range of weather conditions, from extremely hot and dry in the summer, to freezing cold and covered by snow for weeks in the winter. When flowers do appear, they take a full year to open, and individual plants seldom bear more than three or four flowers, despite sometimes reaching 70 years old. 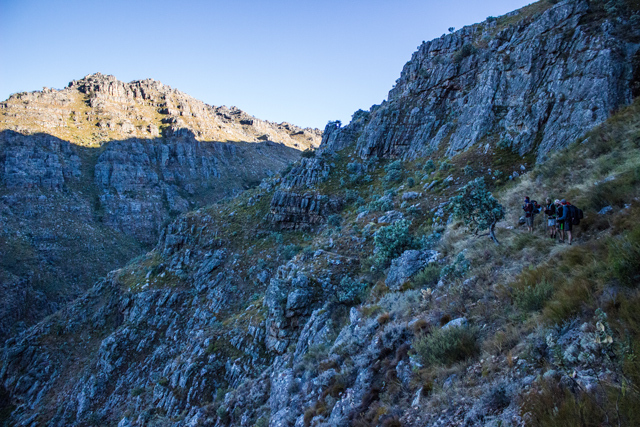 We took a different path down, moving around the back of Sneeuberg following a very vague path. With the sun dipping low on the horizon, we hustled to get off the mountain while there was still light. But we still had time to stop briefly and admire the view. Bags are packed, we’re ready to go. 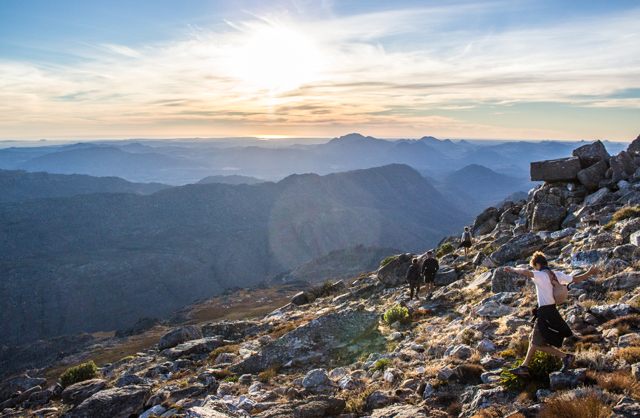 Leaving Sneeuberg hut at sunrise. On day four, we passed through an amazing valley called Duiwel’s Gat. Huge peaks towered above us and an isolated valley dropped in front of us. 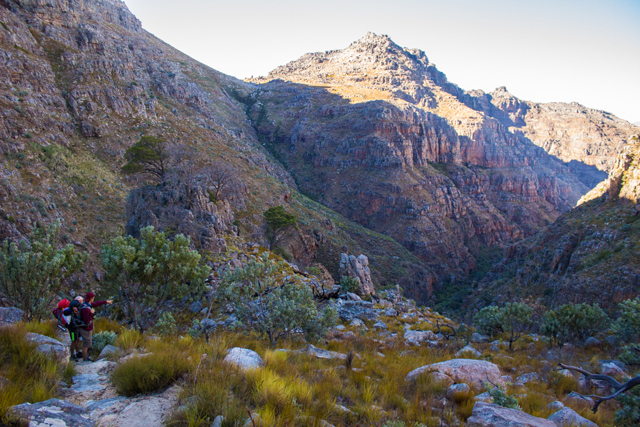 As the valley grew brighter, we walked along this spectacular trail, the most magical part of our trip. 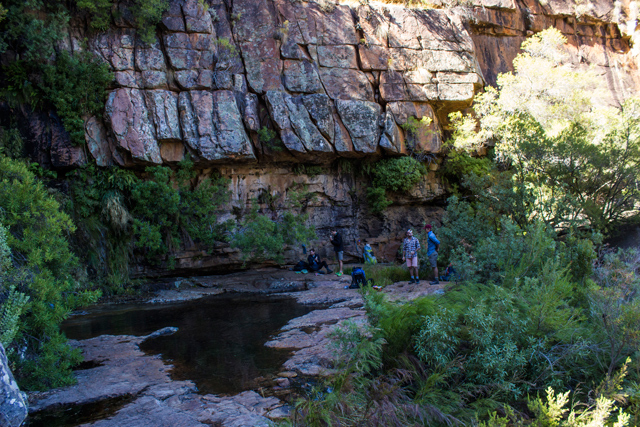 After a wide-eyed stroll through the enchanting valley, we popped out the other side. Looking back on the path we can see Sneeuberg peak in the distance. 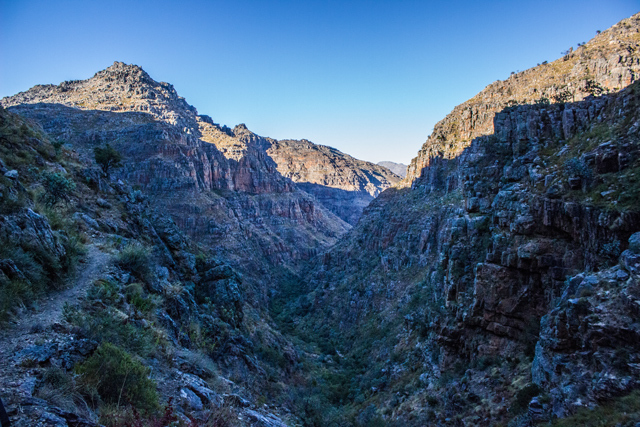 Making our way down the valley towards Uitkyk Pass, where our car was parked and our vast four-day hike ended. 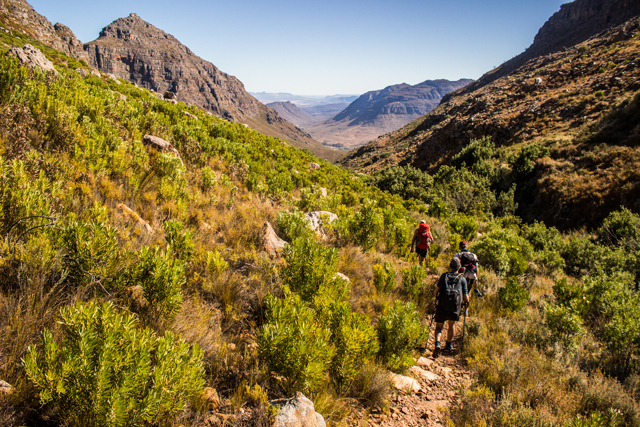 There are many different ways to explore the Cederberg. 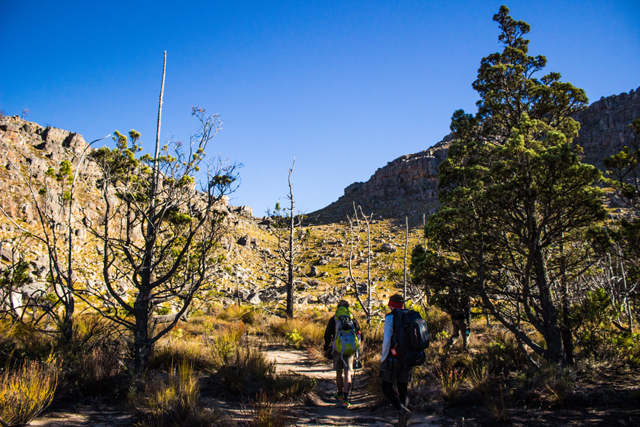 It’s a wilderness area, which means you can free camp wherever you like, you just need a permit from Cape Nature. 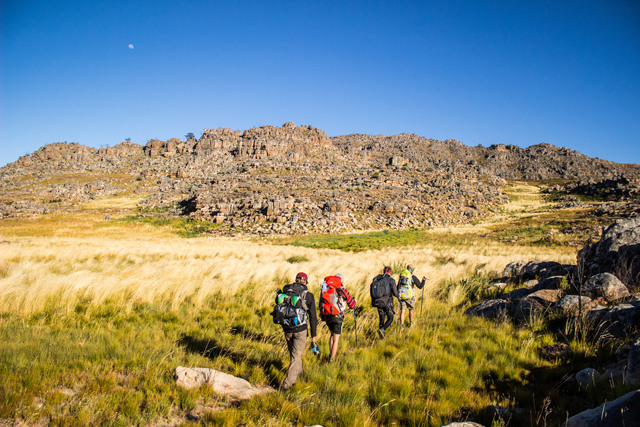 Otherwise, you can stay in one of the campsites that dot the Cederberg Valley (Driehoek, Sanddrif or Algeria) and knock off the day hikes to places like the Wolfberg Arch, Stadsaal, and Maltese Cross. 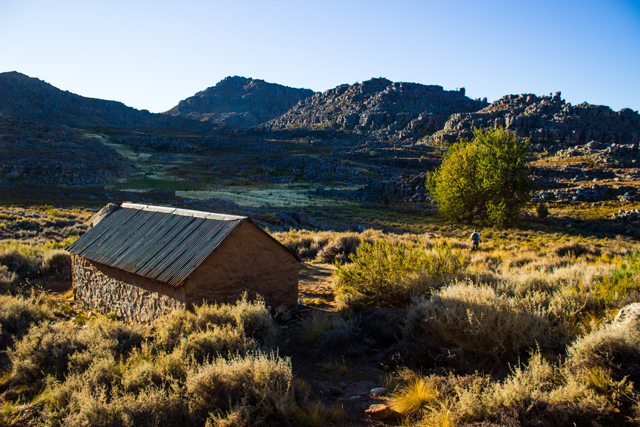 Or you can stay in some of the basic huts that can be found on top of the ranges. That’s what we opted for. 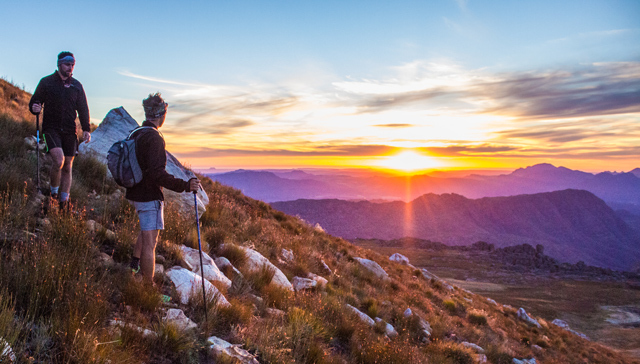 Booking the huts and permits can be booked through Cape Nature. 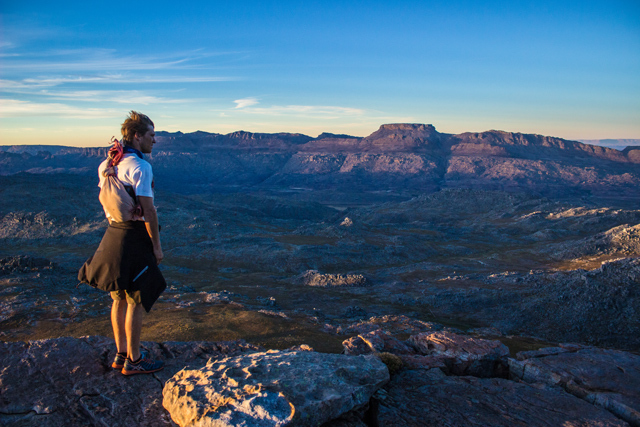 Cederberg Wilderness hiking permits cost R60 per person per day, and the huts cost R120 per person per night. 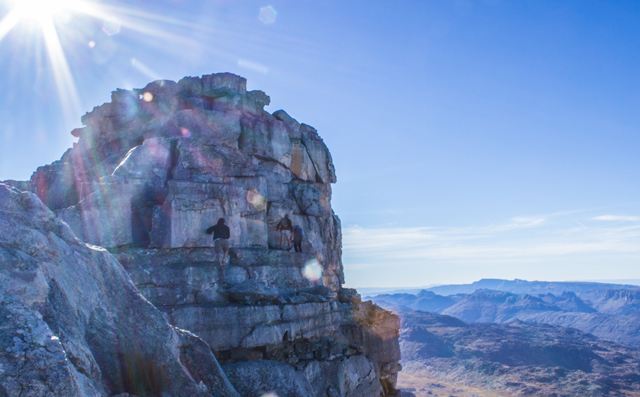 IMPORTANT: An area of the Cederberg was hit by a fire earlier this year and is currently closed. 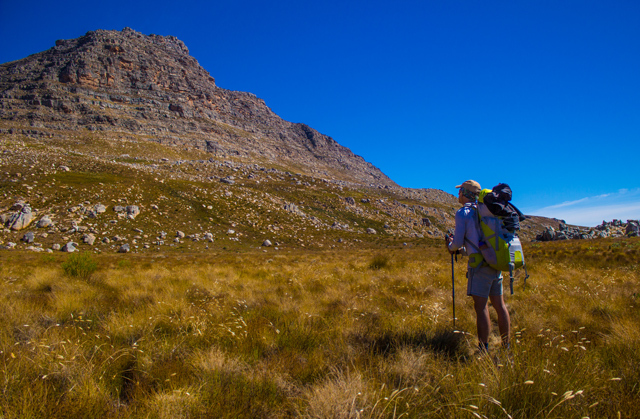 This area includes the Middelberg Hut so the first half of this hike is not currently open. Cape Nature say they will reassess the area after the 2017 winter. Take the N7 highway north from Cape Town. 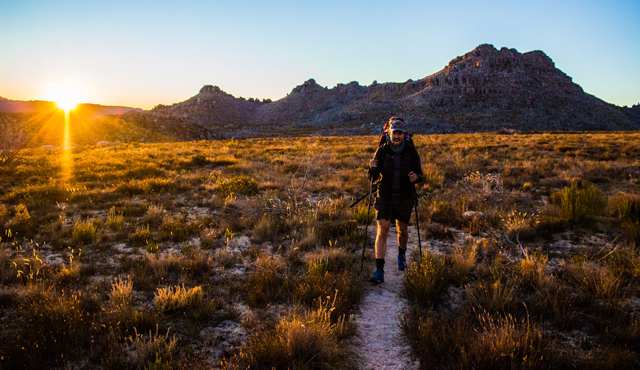 Stay on the N7 past Citrusdal, after 28km take the Cederberg/Algeria turn-off to the right. Follow this main gravel road for 17km you will see the office complex and accommodation and campsite access road on your left. This is a 250km drive, which should take about three hours. If you arrive after hours please report to the gate office. 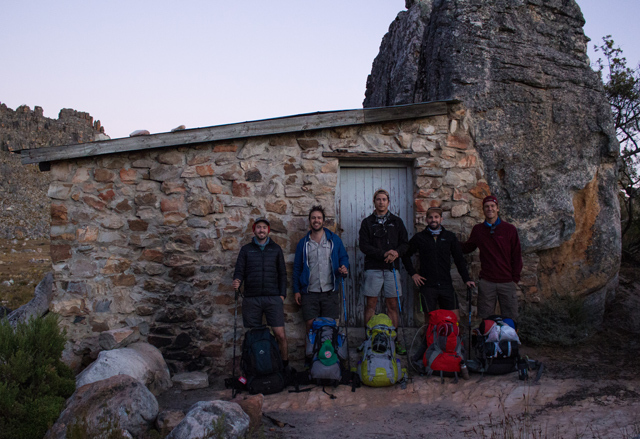 The first night we stayed at the Middelberg Hut. The second day we returned to our cars and drove to Driehoek campsite. This allowed us to restock our food supply and also have a nice braai that night. Doing it that way was the most practical and ensured our bags weren’t too heavy. This is the route we took over the first two days. The bottom blue marker is the Algeria campsite and the top one is the Middelberg Hut. The path is easy to follow. 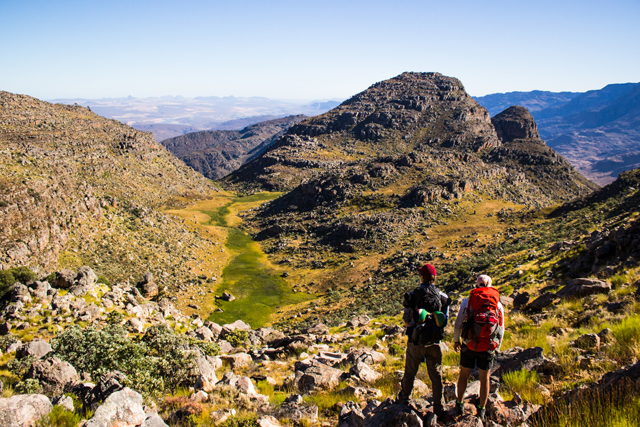 The Sneeuberg hike is a bit more complicated. The map below shows the route we walked on day 3 (but day 1 of the Sneeuberg hike). We parked at the blue marker on the right, made it to the Maltese Cross (middle blue marker) in a few hours and carried on another hour to the Sneeuberg Hut (left blue marker). We parked at the road that comes from Sanddrif past the Observatory, but most people park at Eikeboom and follow the jeep track up to the hut that way. 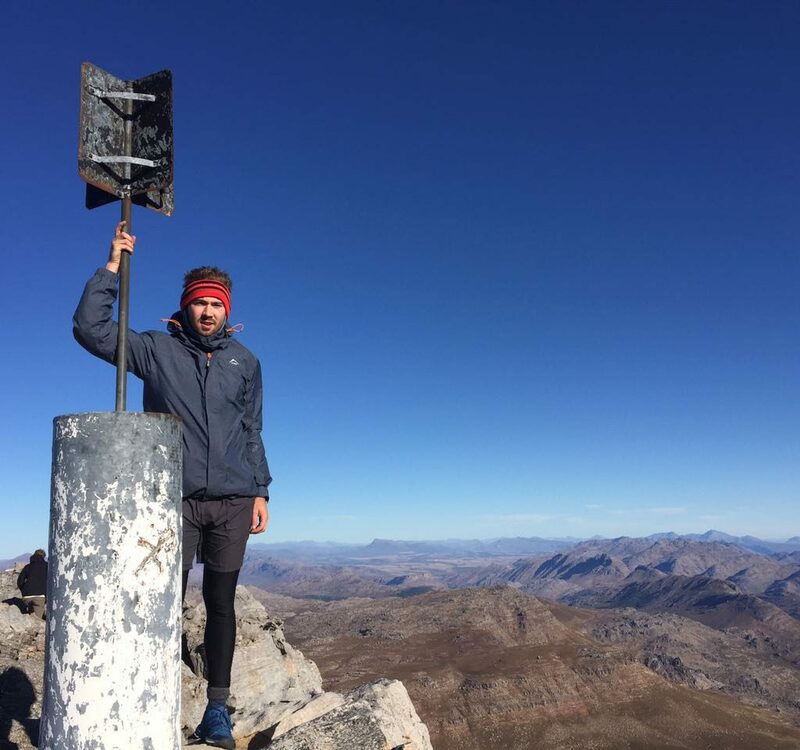 From the Sneeuberg hut to the summit and back is too complicated to explain in words here. 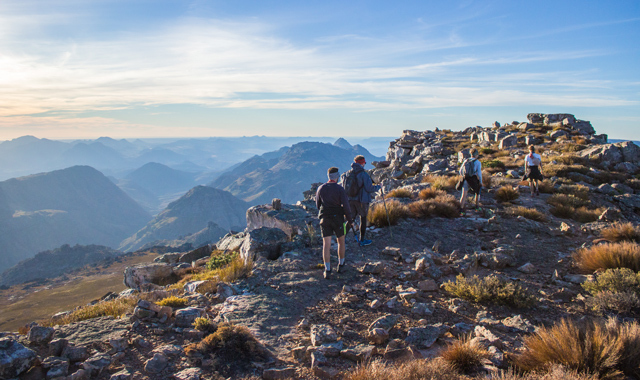 Either speak to Cape Nature or get your hands on Mike Lundy’s excellent Weekend Trails in the Western Cape (it’s like a hiking a bible!). 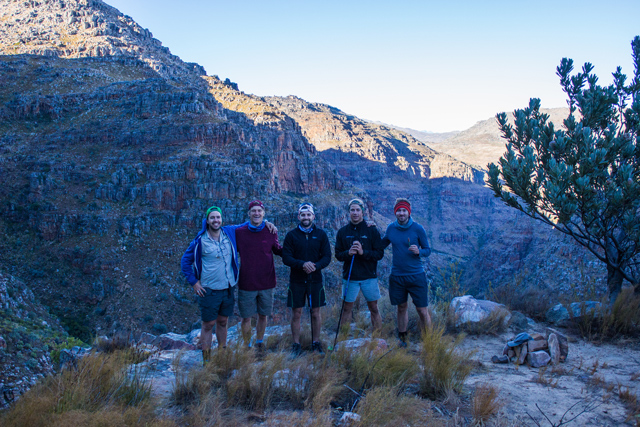 He details the hike in there as well as 23 other great hikes. If you have any questions, please comment below and I’ll do my best to help you out. 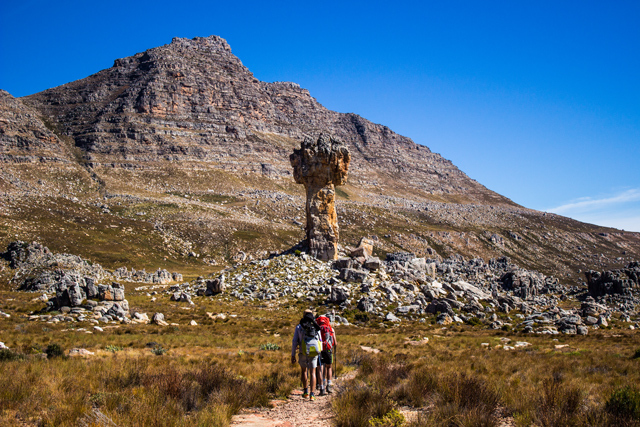 If you would like to read more about hikes in the Western Cape, follow Conquer the Cape on Facebook HERE. What an awesome hike, you guys look like athletes!